Courtesy of the Soft Matter blog, a new open access (until April 20th) report on the clinging behavior of drops on a wire is worth looking at. 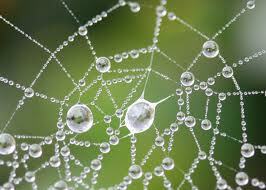 We've all seen such drops, whether they are on spiderwebs, the strands of a dandelion gone to seed, or elsewhere. Looking closely at them, sometimes the drops are below the fiber and sometimes they surround the fiber. The authors not only are able theorize about what make these differences occur (contact angle and drop volume), but they are able to reproduce them and quickly, reproducibly change them by controlling the electrical potential of the wire. A dynamic setup like this is crying for movies and the authors don't disappoint. The images and movies are simply fascinating, especially the movies. Take a quick look even if this isn't really an area that you specialize in (I don't!). As an aside, the paper itself is a very rough read, quite condensed, but very informative. It really looks to me that the authors initially submitted it to Science (or Nature), had it rejected, and then submitted it elsewhere without a rewrite. Too bad, I think this would have been a fine article for either of those two journals. Rock Star Jobs for Polymers? The Changing Definitions of "Thixotropy"
More Thoughts on "Materials Science"
On the term "Materials Science"